Why is it so difficult to get kids to listen? You know they hear you, yet no response. You ask again and…crickets. At the dinner table, repeated requests to turn-off the tablet or smartphone are ignored. Although we live in a perpetual state of hyper-connectivity, we are increasingly disconnected. Kids are bored, teens detached and parents preoccupied. What if there were an activity to engage and bond the entire family? There is, and it doesn’t require spell-check: k-a-r-a-t-e.
Parents play many roles in their child’s development including teacher, motivator and coach. Discussing the value of physical activity beyond using a keypad or digital devices is one approach. However, most kids have an impenetrable “BS” firewall, so leading by example and sharing an activity that entertains and educates is a more effective strategy. In Northern Karate Schools’ forty-five year history, we’ve witnessed many changes in the family-dynamic. What has remained constant is the fact that parents and children who participate in regular Karate practice reap many physical, mental and spiritual benefits. 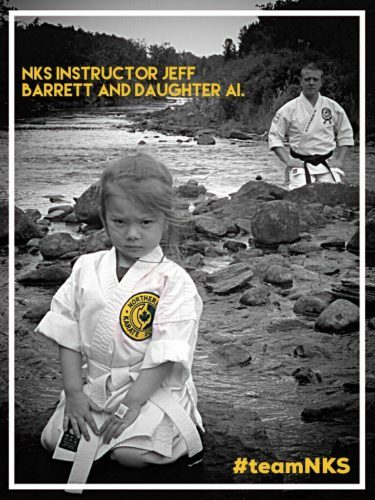 At NKS, the preschooler and his teenage sister train with mom, dad and sometimes, their grandparents*. They take pride in each other’s achievements and discover the joy of learning as they block, punch, kick and sweat together. In an increasingly fractured world, these families are supported and reinforced by a dojo clan. He or she has an opportunity to model parent’s behaviour. The child has a chance to voice their thoughts, needs and feelings. Bottomline: our hope is that that through a unified martial arts practice, families that kick together may stick together as they become stronger individually and as a team.